I know I’m a day late here, but that’s okay :). I subscribe to the JoAnn ad, mostly for the 40% off coupon that’s always in there. Sometimes there’s an additional gem, though; the April ad was was of those times. 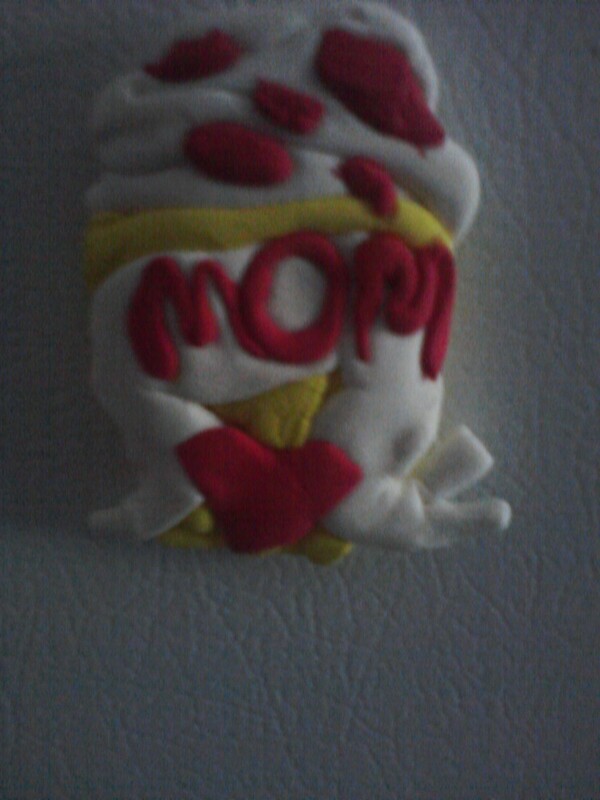 They were advertising something that was taking place in all of their stores, not just the bigger ones: “Kids, come make your mom a cupcake magnet for Mother’s Day.” Well, my kids love making crafts of all kinds (much to the detriment of the cleanliness of my house a lot of the time! ), so this sounded like a perfect opportunity for them to get to make an “official” craft. I recruited my husband to take them in (at ages 8 and 5, they were not interested in letting me take them!) and make these crafts. They were so proud of them that they couldn’t even wait until Sunday to present them to me. Therefore, they’ve had a proud spot on my refrigerator since Saturday afternoon :D.
As mentioned before, this pattern is one of my most used. My eldest son, after seeing the blue/blue blanket for his future-brother, wanted one of his own, so he selected the colors and I put in the work. I’m not going to post the tutorial video again since it’s the same one. Just look at the “Afghan 2 for the New Baby” post to find it. I don’t cross stitch often, but I do enjoy it. I made this one circa 2009, and it’s one of my favorites to this day. I got the pattern from a library book. These were made for my nephew’s second birthday. He’s a huge fan of Mickey Mouse. 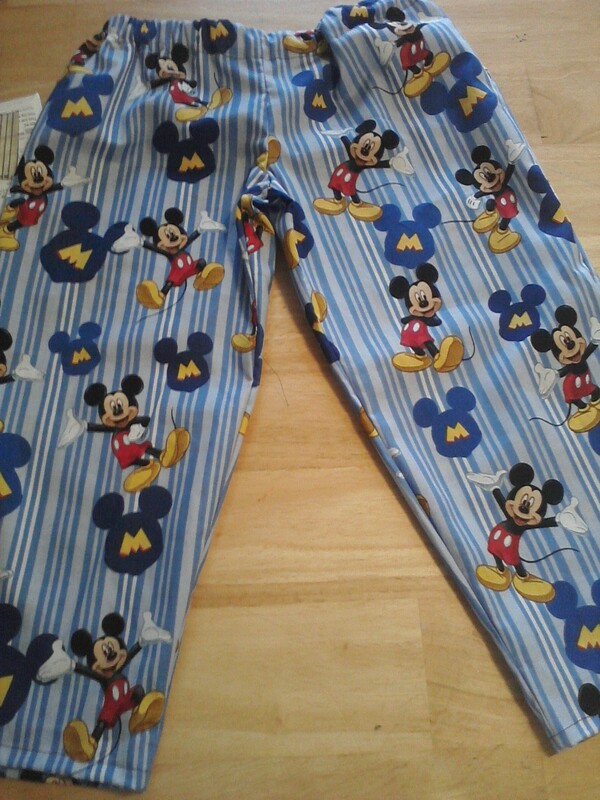 I made similar sets for my two sons for Christmas – the pajama pants along with a bathrobe apiece. My mom thought they were so cute that she asked me to make a set for my nephew. The deal was she’d provide the fabric if I provided the labor, and it would be a joint gift for the little guy. It worked out well! After finishing two fairly major projects, I was feeling confident enough to try something completely new, so I found a tutorial video for this pattern. It’s become one of my go-to patterns now. This one is smaller than the beige one; my thinking was that it could be used for “out and about” once Son #3 is here–it’s big enough to cover a carseat (or a baby in a carseat) completely, but small enough that it will be convenient. It’s not perfectly clear in the picture, but it’s royal blue and sky blue (not white). The colors compliment each other beautifully :). 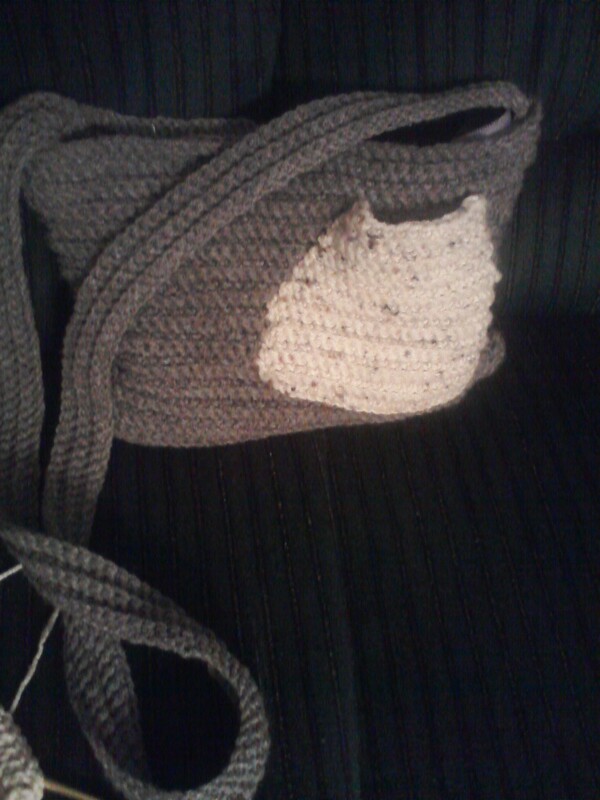 Here’s the purse I made as my first reintroduction to crochet. It’s great, and I love it, but I don’t use it often; I don’t carry much in a purse, so I don’t like the big ones. For one, they’re too cumbersome. For two, my husband seems to think if I have a large purse, he can just add things to it for me to carry for him, lol. That big white-ish area on the front is a pocket for my cell phone; I’ve found that if I just put it in the regular pocket with everything else, I go through screen protectors too fast, so I always keep it separate now. I didn’t use a tutorial for this one; I used the basic stitch that my mother-in-law taught me in 2003. 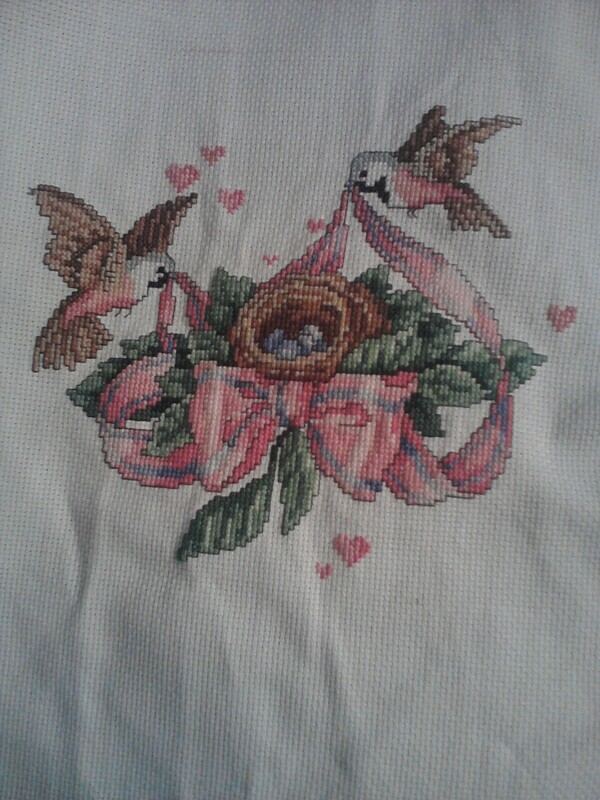 This was made before I started experimenting with other stitches. 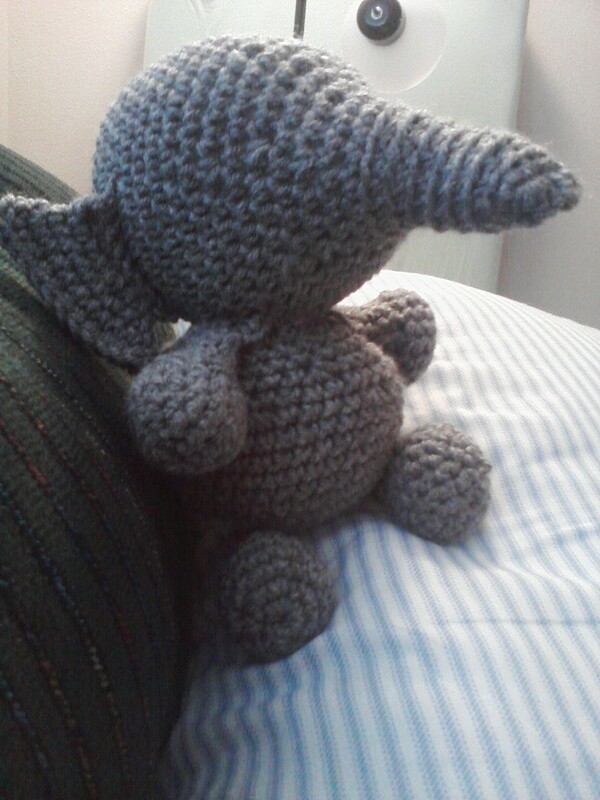 For anyone interested in making your own “Baby’s Elephant,” click HERE for the free pattern, courtesy of Red Heart yarn. I’ve always been afraid of crochet; my first two experiences with it weren’t exactly positive. 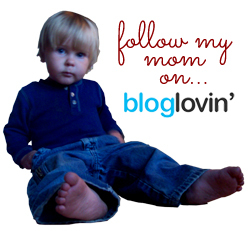 The first was when I was pregnant with my oldest son. 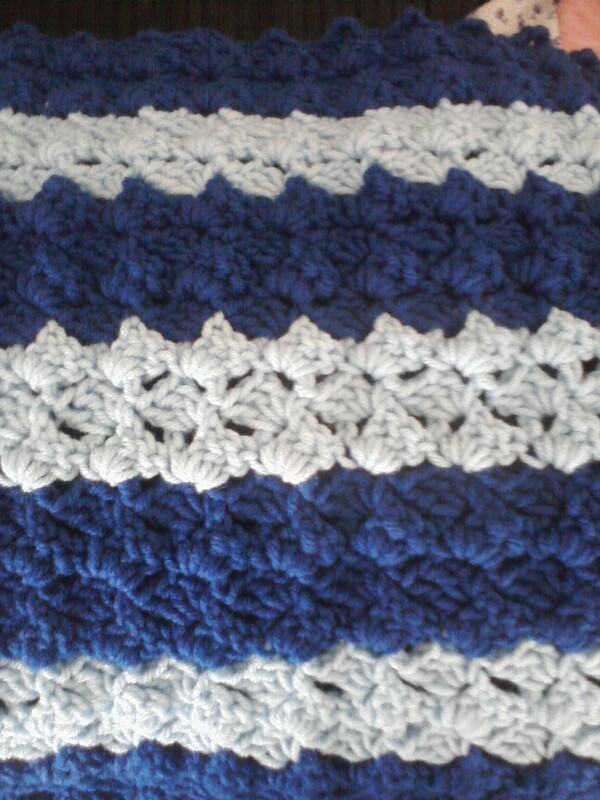 My late mother-in-law taught me a basic stitch so that I could make a baby blanket. 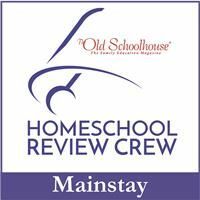 The project took me most of the pregnancy, so I didn’t keep up with it – I’m an “instant gratification” kind of girl. 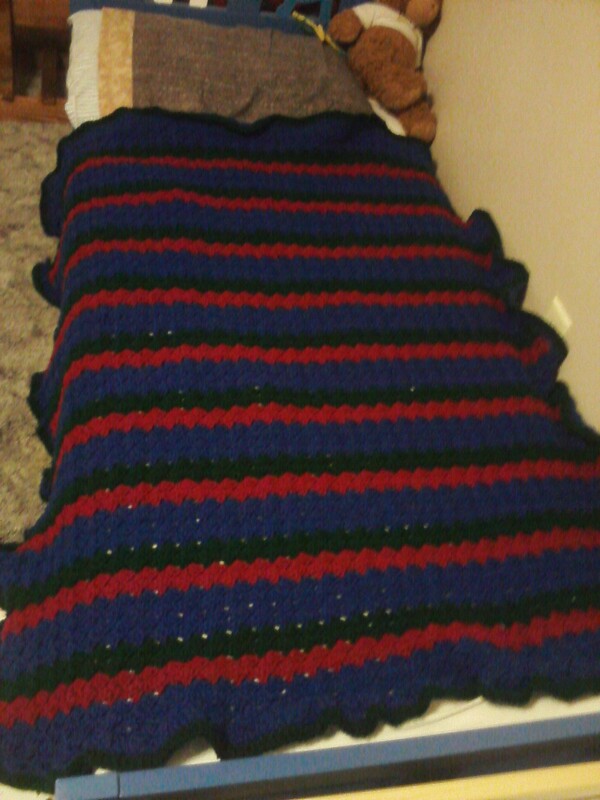 When I got pregnant with my second son, I had an urge to make a similar blanket for him, so I did – my second major project. That one didn’t go any quicker than the first, so I dropped the hobby yet again. When I stopped writing around December 2011/January 2012, my husband noticed that I seemed “aimless,” so he suggested I learn to knit. In his opinion, it would be a good hobby that I could do nearly anywhere. I thought, “What the heck,” and picked up some yarn and knitting needles from our local Jo-Ann store. Well, it turns out that knitting was even harder than crocheting! I tried for hours with YouTube videos and couldn’t get anything to stay on the needles, so the next day I went back to Jo-Ann and bought a set of crochet hooks instead – even if it was slow, at least I already knew how to do it. I had two skeins of yarn to use up, after all. My “first” project was a purse (essentially a piece of crochet “fabric” about 12×19 folded in half and sewn up the sides to make a pocket with a 3×36 strap). 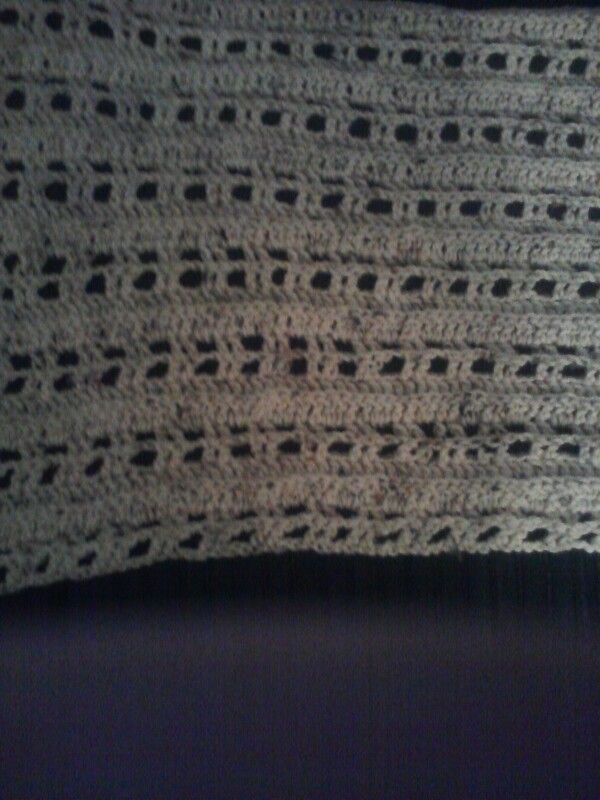 I was able to finish the entire thing (including a zippered liner sewn into the crocheted shell) in about 3 days. Talk about encouraging! I’d never been able to crochet that fast before. That took one full skein of yarn, but I still had one more. I headed back to YouTube to find a pattern I liked for a baby blanket. This was the one I came up with. We found out we were having another boy shortly before I finished this, so I added a royal blue border when I was done, and voilà! A baby blanket that didn’t take the entire pregnancy to complete! 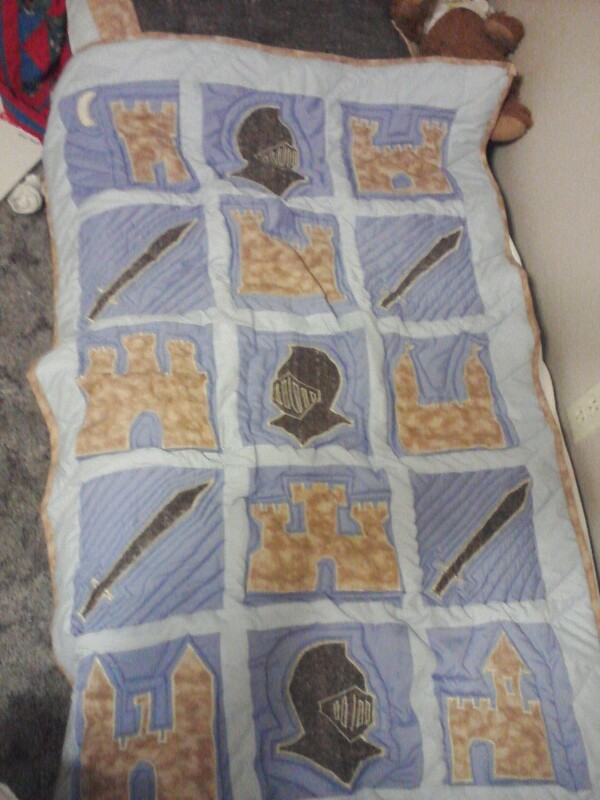 We recently redecorated my sons’ bedroom, and they chose a “Knights in Shining Armor” theme, so of course I had to make them new quilts to go with the new theme! 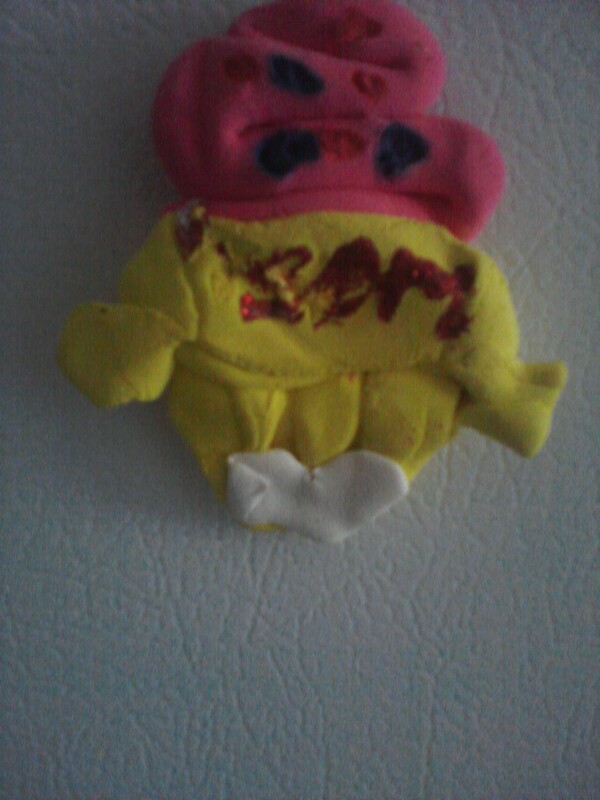 I made the appliques from clip art images, and let each kid choose his own color for the background of the pictures. They both chose blue, but in different shades, so I used the leftovers from one’s for the sashing on the other’s. 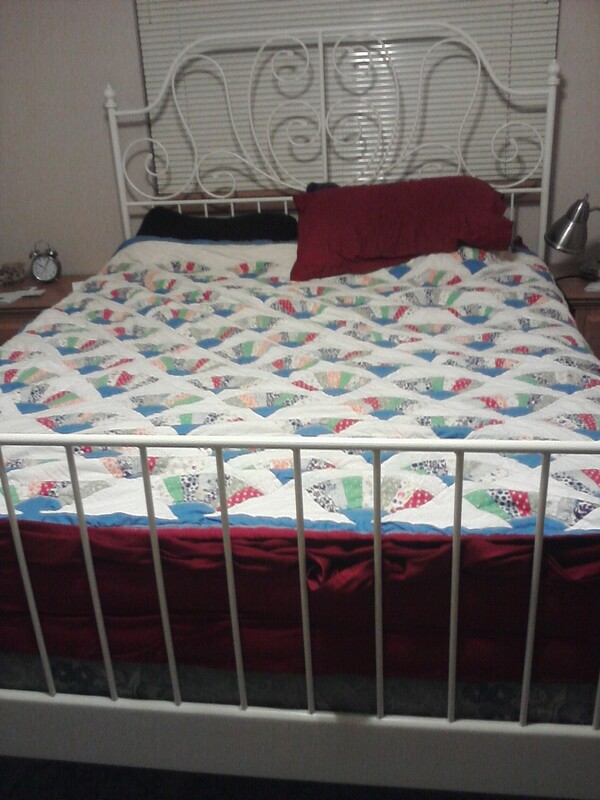 These took a bit of math, too, because their beds aren’t a standard American size. I planned them carefully so that they would be approximately the size of the beds. I love sneaking in on them while they’re sleeping and seeing the matching quilts keeping them warm! 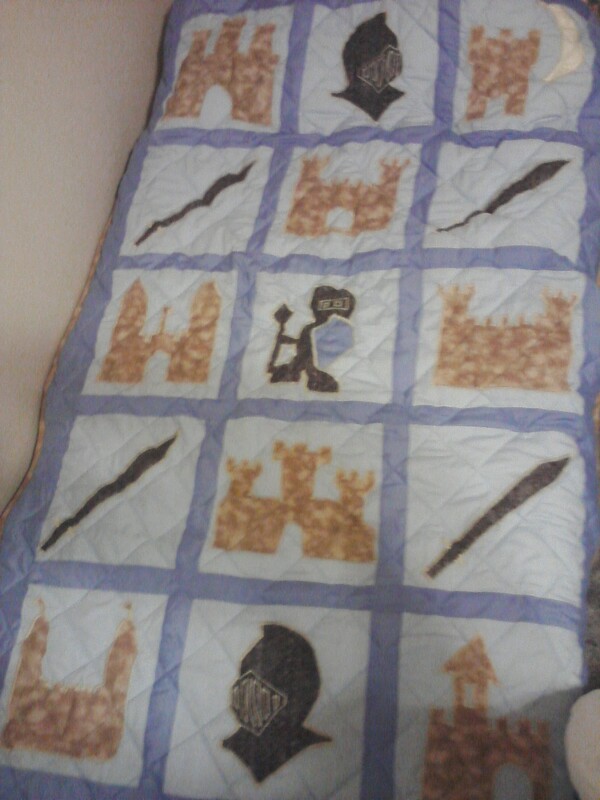 You just saw this quilt underneath “Christmas Present Joe,” but it’s elaborate enough to get its own post! It was made in 2009, and took over a month to complete due to its 900+ individual pieces. I got the pattern from a library book.